Who will have power over airport? The Hailey City Council voted to sign an amended joint powers agreement with the Friedman Memorial Airport Authority on Monday night, bringing a months-long power struggle over the existing and replacement airports closer to a resolution. But amid the complicated procedures and legal wrangling, one elected official said he sees a "gap" in the community's understanding over what the agreement says and what it means for Blaine County and the replacement airport. "Community understanding and trust should be job No. 1," said Commissioner Larry Schoen during an interview last week. "It's centrally important that the community has an idea of where we're going and how decisions will be made." What is the joint powers agreement? 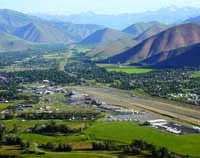 The agreement is a legal document drafted in 1994 to lay to rest the question of whether the city of Hailey or Blaine County has authority over decisions made regarding the jointly owned Friedman Memorial Airport and the county-sponsored replacement airport. For now, all authority over the existing airport rests with the Friedman Memorial Airport Authority, which has a governing board made up of both city and county representatives. The authority has the power to make decisions regarding the business and financial affairs of the existing airport, appointment of an airport manager and supervision of repairs and improvements to buildings. Decision-making power over the proposed replacement airport remains in flux, however. The project has been put forth largely because the Federal Aviation Administration has determined that Friedman cannot meet certain safety standards over the long term. Blaine County is meant to be the sole "sponsor" of the replacement airport, taking on all management and financial responsibilities. Allowing the county to shoulder the full burden required amending the agreement from its original version. The authority has been working with Denver-based attorney Peter Kirsch to ensure that the agreement outlines the smooth transfer of power once Friedman Memorial closes and a replacement airport opens. However, the amendment process itself has been anything but smooth. The city and the county have resisted signing the amended agreement since hearings began in December 2010. The main sticking point, according to elected officials, is determining when the transfer of power should occur—upon closure of Friedman Memorial or when the last parcel of land at the existing airport site is sold. Under the current proposed amended agreement, the city of Hailey's representatives on the authority will relinquish control over both airports once Friedman is officially closed to traffic. However, they will retain control over the sale of all land at the existing site, as well as funding for the site's cleanup. Hailey Councilwoman and authority board Vice Chair Martha Burke said during a council meeting earlier this month that retaining this power is crucial to the city, which has a financial stake in the sale of the land. "The site will have to be cleaned up," she said, adding that funding for that would have to come from land sales and the FAA. Burke argued that the city also will need control over sale of the land to make sure it will be developed in ways that benefit Hailey. However, Schoen said in an interview that involving the city in real estate transactions "complicates" matters, especially when it retains control over the land through its planning and zoning process and its master plan. Proceeds from land sales will go toward the replacement airport, which would be funded by the FAA and, in smaller part, the county. Schoen argued that the county needs to have full power over land sales, as it has the greatest financial stake in the replacement field. "The county needs sole discretion if they are going to be the sole owner of the new airport," he said. "If the county's not going to be the owner, the community needs to know that." Another issue that has reared its head over the past few months is whether the airport will be relocated at all. Friedman operates under a waiver that allows it to accept commercial air traffic despite its non-compliance with federal safety standards. The authority determined years ago that expanding the current airport to comply with federal standards, which would require land acquisition and moving state Highway 75, was not a viable option. Schoen, however, has consistently advocated keeping Friedman expansion as an option, saying he is "not set" on relocation, especially as expansion of the current site may be cheaper than the replacement airport's currently estimated $325 million price tag. "In today's world, it really comes down to what we can afford," he said. "At some point, you bump up against reality." Hailey City Attorney Ned Williamson said during Monday's City Council meeting that the city's version of the agreement makes it clear that the replacement airport must be separate from the current site and that the current site will not house an airport once Friedman closes. Though the city's agreeing to sign the current version of the agreement is progress, the process hasn't been completed. County Commissioner and authority board Chair Tom Bowman said the commissioners still need to vote on and sign the latest proposal. Bowman said he hopes to have Kirsch review the final version before it's scheduled for a public hearing within the next two weeks. Schoen said he was not likely to sign the agreement unless it was revised to clarify that the county is the sole owner and sponsor of the replacement airport. The final version of the agreement, signed by the commissioners and Hailey City Council, is subject to FAA approval. Express reporter Tony Evans contributed to this story.